On Youth Day (16 June), Ndivhuho Tshikovhi (26), a master’s degree student in Entrepreneurship at the Tshwane University of Technology, travelled to St Petersburg in Russia to represent South Africa at the Y20 Summit 2013. Ndivhuho is one of only five South African students selected to attend the event, to be held from 18 to 21 June. The Youth Summit will bring together the brightest young people from the G20 countries to discuss issues closely elated to the topics of the G20 Leaders’ Summit. It includes topics such as financial and international monetary systems and sustainable development. To Ndivhuho, chairperson of the Capital City Junior Business Chamber (CCBC Jnr), these topics are quite familiar. 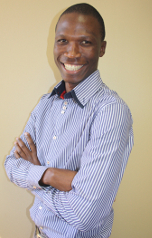 He also serves on the Department of People Management and Development’s Advisory Committee and is a research assistant to Prof Mokubung Nkomo, acting Deputy Vice-Chancellor of Postgraduate Studies, Research and Innovation. “As young boys, growing up without really much to think about or do, all of us wanted to become doctors or lawyers. But in my case these dreams were shattered by not being all that good with mathematical subjects and not having enough role models to look up to,” says Ndivhuho. Ndivhuho adds that his dream opportunity would also not have been possible without the support of Dr Stanley Mukhola, acting Deputy Vice-Chancellor of Teaching, Learning and Technology, who is sponsoring his trip.